Laugh out loud funny funny and with substance. These brothers write without filters...just as we think and feel. It never ceases to amaze me that each of their films captures my laugh gene. They also cast their films perfectly. Truly gifted filmakers. although very raunchy at times - i laughed during the entire movie!! Entertaining movie! Owen Wilson was great! kept me laughing through the whole movie, and it wasnt predictable! 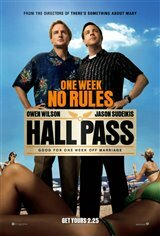 Very funny movie with a lot of realistic thoughs followed by unrealistic scenarios. Overall made me laugh. Owen Wilson was very believable as a nerdy loving husband.